In a newsletter from May 2017 I announced starting work on a first-person roguelike based on my still-unnamed engine. Half a year later, I casually mentioned picking up the abandoned prototype as if having written about it already, which probably confused a few people because the only clue at that point had been a tweeted screenshot! 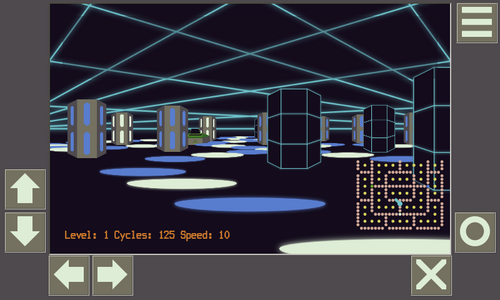 an ill-suited level generator borrowed from another game, that no tweaks could improve sufficiently. Amazing how much trouble those ill-conceived backgrounds could cause at the time. The fix was to realize I didn't need a neon grid on the floor: the networks of stepping disks was more than enough. With it gone, the ceiling can now extend all the way to the horizon, and while it doesn't look quite as good as before, nobody has complained yet. Another fix was to simply pull back the camera by one meter, which keeps it within the same terrain tile, but restores a good deal of peripheral vision, without forcing me to change the aspect ratio to 16:9, which would look awful. As a bonus, now you can see when you're standing on the teleporter! I could also play with the focal distance (technically, camera length since it works more like a pinhole camera), but this looks better. Last but not least, after some amount of wasted paper, it occurred to me that handcrafted maps would better fit this particular game. Wouldn't be the first roguelike that chooses randomly from among a fixed selection, and that doesn't prevent everything else from being procedurally generated, so as to make for a different game every time. All that took a bit of time, especially as I was careful not to overwork myself anymore, but it was worth the wait: running around the maps is satisfying, things look good (especially with a third type of column for variety), and people grasp the game objective right away. Not so much the time limit, but oh well, most gameplay isn't yet in place anyway. 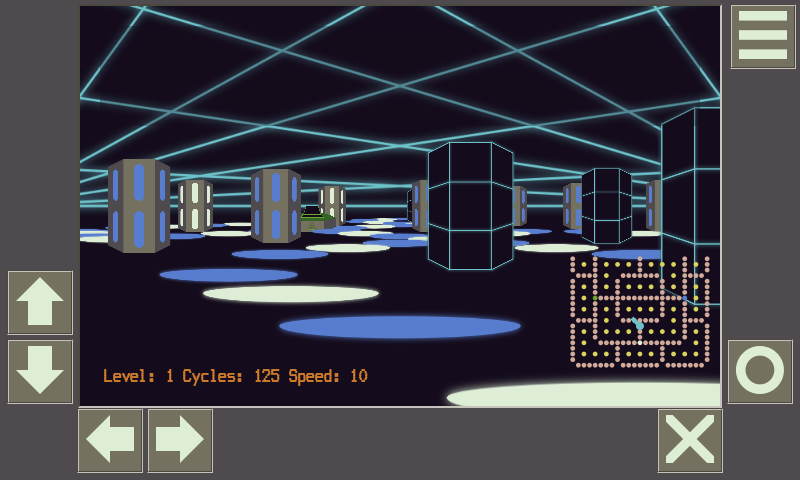 Better leave that for another post though, and yet another will be about the map editor I had to devise for this game.